Classification: Sub-species of humanity/"Hidden races"
Powers/Abilities: The Sun People are a humanoid tribe of warriors that possess no superhuman abilities. Fiercely loyal to their leader, they worship the sun god Garokk and blindly follow his orders and that of his high priestess. Brutal and blindly obedient, the Sun People have been driven to slaughter and massacre other Savage Land species, using spears and archery in combat. Most of the Sun People are also skilled at riding flying pterodactyls, forcing the large beast to do their bidding. Some of them were also seen riding a pack of ferocious birds called the Warbird, beasts trained by Lupo to obey commands. (Astonishing Tales I#5/1 (fb) - BTS) - Centuries ago there was a large tribe of people living in the Savage Land that were called the Sun People. The Sun People were devoted to their deity dubbed the Sun God. To honor their god, the Sun People built a city, albeit primitive. In the caverns beneath their city flowed what they called a black pool which they used to heat their homes. The liquid from the pool was fabled to grant immortality, power, and madness to those who drank it. (Astonishing Tales I#3/1 - BTS) - The Sun People built a large stone statue of the Sun God's head, making it into a shrine surrounded by chalices filled with fluid from the black pool. The Sun People hoped and wished he would one day return to them. (Astonishing Tales I#3/1 (fb) ) - Five hundred years ago a sailor washed up on the Savage Land after surviving a shipwreck. Exploring the island by nightfall he located the Sun People's city and the shrine for their god. Although the man noticed the statue was glowing with what he considered to be unholy light, he quenched his thirst by drinking from the chalices unaware of the fluid's origin. He was soon noticed by the Sun People who approached the stranger armed with spears. The tribesmen tried to follow and kill the man for defiling their shrine. However, he managed to escape and eventually found his way back to civilization where he continued to live his life unaware the contents of the drink had changed him. (Astonishing Tales I#3/1 (fb) - BTS) - In the years that followed, the sailor led a quiet, unremarkable life unaware his skin was slowly petrifying and turning to a likeness of the Sun God. He was becoming a host body for Garokk the Sun God. (Astonishing Tales I#3/1 (fb) - BTS) - In modern times Zaladane, an ambitious female of the Sun People tribe, ascended to the role of queen priestess of the sun god. She watched closely for the signs and prophecies of her god and was regarded as the Sun People's leader. (Astonishing Tales I#3/1) - The Sun People awaited their Queen priestess Zaladane as she took place on a plateau to speak to her people. Zaladane told them that the prophecies, the ancients had promised had come to pass; temples filled with strange mists and grasslands dewed with golden waters. Everywhere they could see the omens had grown to fruition thus meaning the first age of the sun was ending and the Sun King was surely to return. To be worthy of his return, Zaladane proposed to offer him new conquests, believing their empire had mouldered under the banner of peace for too long. Faithfully believing Zaladane's words the Sun People raised their spears to show their support. (Astonishing Tales#3/1 (fb) - BTS) - The Sun People led by Zaladane killed and enslaved many of the Savage Land tribes. Among the dead were the wife and child of Tongah, chieftain of the Fall People. (Astonishing Tales#3/1) - While riding a flock of pterodactyls, Zaladane led a group of the Sun People's finest warriors to the north to find and destroy the kingdom of the lizard men the Vala-Kuri. Unaware they were spotted by Ka-Zar, his vengeful friend Tongah and the former sailor who was becoming Garokk. The prophecy was in fact coming true. (Astonishing Tales#4/1) - Zaladane and the Sun People warriors immediately attacked upon arriving at the city of the Vala-Kuri. Tossing fiery bombs and spears, they sought to kill all that they saw. However, Ka-Zar soon arrived commanding the citizens to defend themselves. The Vala-Kuri were a peaceful race and didn't have any tools of war. Ka-Zar decided to try and defend the city by himself and successfully defeated several of the Sun People. Zaladane saw Ka-Zar fighting against her men and invited him to join her. When he refused, she prepared to toss a bomb at him, but it was knocked out of her hand by Tongah. Before anyone could act,a fiery image of the newly transformed and resurrected Garokk appeared before them. Garokk demanded peace and surrender, an order the Sun People obeyed, immediately laying down their arms which infuriated Zaladane to no end. Still seeking glory and blaming Ka-Zar for her defeat, Zaladane had her winged steed grab Ka-Zar and flew away. 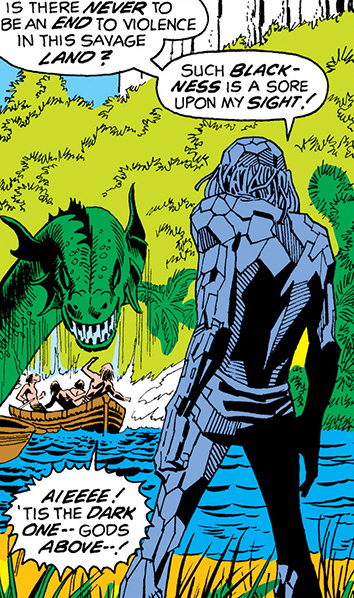 (Astonishing Tales I#5/1) - Three boats filled with Sun People were attacked by a towering sea creature they recognized only as the dark one. Garokk witnessed the event and sought to stop the beast by releasing a powerful energy blast. When he opened his eyes and fired, the beam not only killed the beast but his people as well. This sparked a dark realization within the Sun God's mind: for the peace he desired to happen, he would have to kill man and beast alike. (Astonishing Tales I#5/1) - Zaladane directed Ka-Zar to the caverns beneath the Sun People's city, because she reasoned that Garokk's mortal guise would be there. After Zaladane had revealed the black pool and the only way to stop Garokk would be for him to bathe in the fiery pool. She then rushed off, leaving Ka-Zar to battle the guardian of the cavern. The towering Guard-Beast attacked Ka-Zar but was soon defeated by the lord of the jungle. 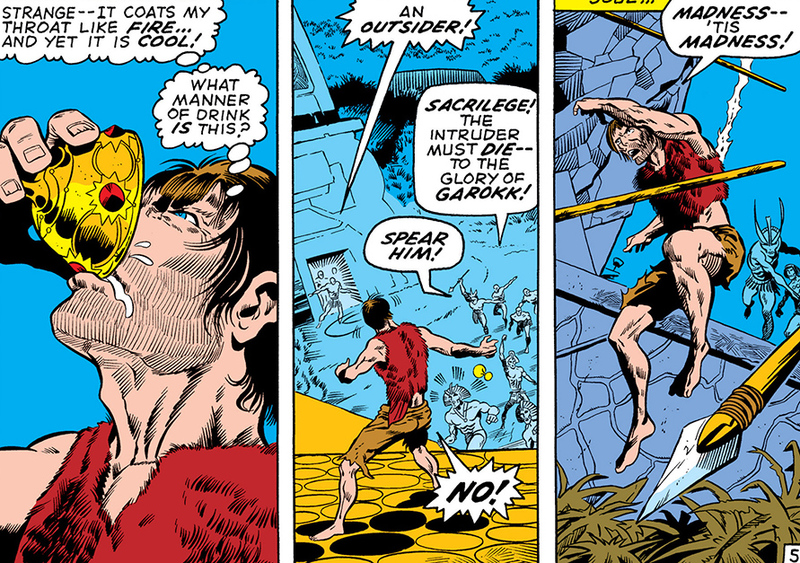 When Ka-Zar exited the cavern he was met by Garokk who'd gone mad and tried to kill everyone and everything in sight. During their battle the floor accidentally caved in causing Garokk to inexplicably fall into the black pool, thus killing his mortal body. Thinking the threat to be over the Guard-Beast clawed his way out from under the rubble to attack Zaladane. However, before Ka-Zar could act the large stone statue of Garokk fell on top of the duo, trapping the Guard-Beast and Zaladane in the caverns. (Uncanny X-Men I#115 - BTS) - Zaladane escaped the caverns and returned to her former position of Queen priestess of the Sun People. (Uncanny X-Men I#115 (fb) ) - The Sun People grew furious when the Sheenarians brought their extradimensional city into the Savage Land. Zaladane led several priests and acolytes in kidnapping outsider Kirk Marston. Marston was deemed the perfect vessel for Garokk's rebirth and chained to a massive slab. A large gathering of Sun People were present while Marston begged for his life. Zaladane then daubed Marston's chest with sacred oil containing Garokk's ashes. Within moments, Marston's form began to glow and change until his form burned away and a resurrected Garokk stood in his place. Back in the land of the living Garokk took on his first task and banished the Sheenarians city. (Uncanny X-Men I#115 (fb) - BTS) - It was then decided that the Sun People would construct a new city of their own. The City of the Sun God was intended by Garokk and Zaladane to be a place where all the tribes of the Savage Land could live in peace, even if they had to be forced to do so. The Sun People tapped into the advanced, alien machinery that kept the Savage Land in operation, unaware that they were inadvertently harming the land itself. (Uncanny X-Men I#115 (fb) ) - During the construction of the new city they came under attack by the forces of Karl Lykos, Ka-Zar, Nereel, and Tongah of the Fall People. The Sun People struck hard and forced them to retreat back into the jungle. (Uncanny X-Men I#115 - BTS) - Once the massive, domed capital city was finished and put into operation, it caused such a massive power drain on the Savage Land's terraforming machinery the eco system changed and the tropical jungle was turned into a frozen wasteland. (Uncanny X-Men I#116) - The Sun People sensed the arrival of Ka-zar and his friends the American superheroes the X-Men. Kor-At and some of his most skilled warriors were sent out to capture them. 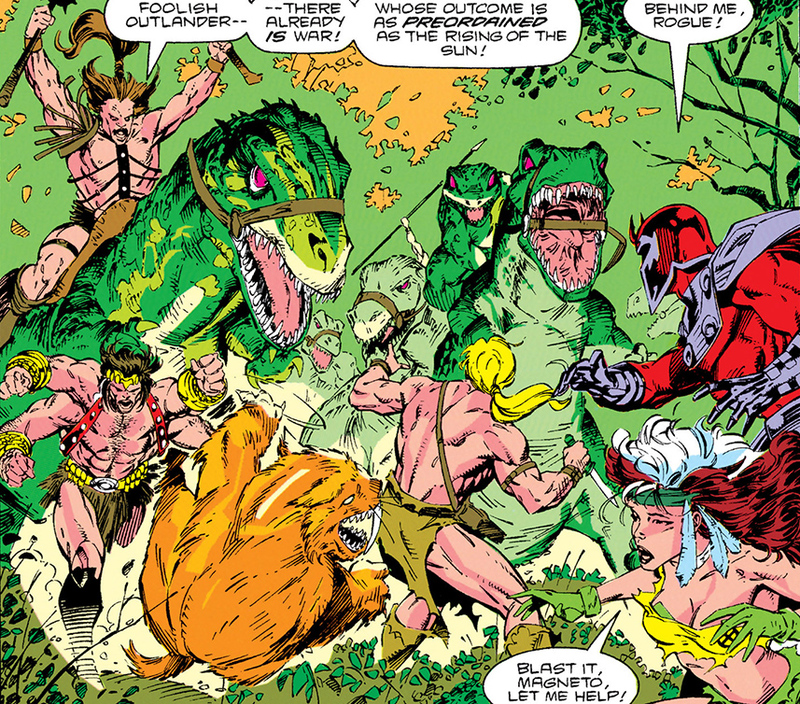 Riding the flying pterodactyls, Kor-At and the others quickly gained the upper hand and managed to capture Cyclops, Colossus, Banshee and even the jungle lord himself. Retreating back to the dome the warriors left the remaining heroes (Storm, Wolverine, Nightcrawler) to fend for themselves. (Uncanny X-Men I#116 - BTS) - The captured heroes were brought before Garokk and Zaladane who planned to execute them publicly. Ka-Zar and the X-Men were tied to stakes in the middle of the structure's giant arena where a crowd was gathered to witness the proceedings. (Uncanny X-Men I#116) - The armored mutant Colossus was burned at the stake, while his metal body began to glow bright red Garokk explained their reasons. Their executions would serve as an object lesson to those less enlightened members of the Savage Land that Garokk would brook no transgression of his law of "peace". However, before all those present could find out if Colossus' body would melt the remaining X-Men arrived to free their friends. Unable to withstand the full force of the mutant heroes, the guards were quickly defeated. Depleted from the construction of his city, Garokk was forced to flee the scene. He made his way to the machines on top of the city where he planned to absorb more power from the dome's grid. Cyclops pursued him and they fought until the ground beneath them collapsed. Garokk and Cyclops fell to their deaths as Storm and Banhee flew after them. The X-Men's leader was saved by Banshee, but Storm failed to grab Garokk in time. With the apparent demise of the Sun God, the Savage Land returned to its normal state. (Marvel Fanfare I#1 (fb) - BTS) - After Garokk's defeat it were the Savage Land Mutates who took over the abandoned citadel. Planning to rule all of the Savage Land the Sun People took a liking to their conquering spirit and decided to join them. (Marvel Fanfare I#1) - Brainchild, leader of the Savage Land Mutates noticed the sudden arrival of a U.S. Navy helicopter and sent both the Sun People and his mutates to capture them. The new arrivals were; Tanya Anderssen, accompanied by X-Man Angel and news reporter Peter Parker who had come to find Anderssen's lover Karl Lykos. The Sun People located the foreigners and attacked them, while one group of airborne warriors riding their pterodactyls went after Angel the other warriors attacked Peter Parker and Tanya. 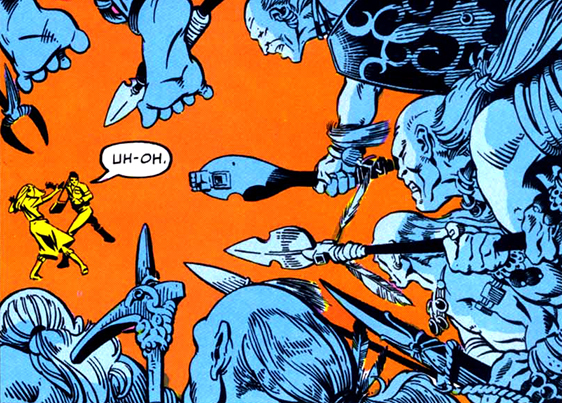 Vertigo, one of the Savage Land Mutates joined the airborne warriors and used her abilities to distort Angel's equilibrium after which he was easily caught by the warriors. Down in the jungle Parker and Tanya were pushed up against a cliff edge and Parker pushed Tanya over into the river after assuring she could swim. Parker then quickly donned his Spider-Man costume and successfully defeated all of the Sun People warriors. Thinking the fight to be over he was hit by Vertigo as well after which Spider-Man was easily defeated by Gaza and Barbarus. Both Angel and Spider-Man were then subject to Brainchild experimentations who devolved them using Magneto's old genetic transformer. (Marvel Fanfare I#2) - Brainchild had ordered the Sun People and the newly devolved Angel and Spider-Man to find and capture Tanya Anderssen. Tanya, however had been reunited with Karl Lykos and now found refuge with Ka-Zar and the Fall People. The Sun People attacked the Fall People's settlement, killing eleven and seriously wounding nineteen with their poison-tipped blades after which the devolved Angel successfully captured Tanya. But once the devolved Spider-Man found some of his human soul and fled the battle the Sun People were left without any superhuman assistance and were soon driven out by Tongah and the remaining warriors. Back in the abandoned citadel it was Karl Lykos who ultimately sacrificed his human-self to save Tanya, Angel and Spider-Man. Realizing that the only way to save Tanya was to absorb the machine's energies. He touched her and did so, despite the risk it presented of turning him back into Sauron, then repeated the procedure on Angel and Parker, reverting all three of them back to normal. Transformed into Sauron again but struggling to remain in control, Lykos fled, promising to have his revenge on Ka-Zar. (Marvel Fanfare I#3 (fb) - BTS) - The Sun People were part of a new alliance between Sauron, Zaladane and the Savage Land Mutates and built a large citadel, which sapped the will of anyone else who approached it, in the Savage Land, and they planned to rule the Savage Land together. Brainchild constructed another machine, calling this one his mutant energy accelerator. (Marvel Fanfare I#3 (fb) - BTS) - While Ka-Zar and Shanna were gone to explore Pangea combined with the death of chief Tongah of the Fall People all major obstacles to conquering the Savage Land were gone. The Sun People guided by Zaladane and the Savage Land Mutates conquered the Savage Land. The Sun People destroyed the Fall People's village, burning their huts to the ground and crucifying the elders to send out a warning. (Marvel Fanfare I#4 (fb) - BTS) - During their raid on the Fall People Tanya and Shanna the She-Devil were captured, presumably by the Sun People after which they were devolved into neanderthals, and imprisoned. (Marvel Fanfare I#3) - The X-Men (Angel, Colossus, Nightcrawler, Storm, Wolverine) came looking for Sauron, and they were led by Amphibius near the citadel, where their wills were sapped by the large citadel. Sauron revealed himself, followed by a horde of the Sun People warriors riding their pterodactyl-steeds. Sauron easily hypnotized the X-Men into defeat, though Angel escaped by fleeing into the cold upper atmosphere (which Sauron couldn't stand). The X-Men were strapped into Brainchild's machine, and Sauron planned to continually devolve them and absorb their energy, giving him an endless energy supply. (Marvel Fanfare I#4) - Several of the Sun People warriors were guarding the citadel while Sauron had gone off to attack Angel, unaware Ka-Zar had infiltrated the citadel and rescued Storm from Brainchild. The duo then took out one of the guards, granting them access to the room where Zaladane was torturing the remaining X-Men. Just as Storm fought Zaladane and freed the X-Men, a group of warriors and mutates arrived to fight them. However, reunited the X-Men easily defeated the warriors, now preparing for Sauron's imminent arrival. When Sauron arrived with an unconscious Angel Storm used her abilities to hit the villain with a massive cold front. After being buried in a rockpile Storm atacked Sauron again after which he reverted back to Lykos, drained of all his energy. The Sun People warriors were most likely driven back into the jungle while Lykos, reunited with Tanya returned back home with the X-Men. (Uncanny X-Men I#249 - BTS) - Zaladane learned Polaris had gone into hiding in South America and decided to send her forces to Punta Arenas to apprehend the mutant, whom she believed to be her sister. (Uncanny X-Men I#249) - Zaladane's forces arrived in Punta Arenas, riding a group of Warbirds, dinosaur-steeds they quickly got her scent. Meanwhile, sailors Luis and Ramon had just found Polaris covered in glass after facing the psionic entity that possessed her, Malice. While Ramon escorted her to a local bar while Luis was on his way to find a doctor when he was confronted and subsequently killed by the dinosaur riders. Zaladane's forces then continued their hunt, raiding a sailor-bar where Ramon had brought Polaris. The Savage Land barbarians slaughtered everyone in sight and successfully captured Polaris. Near the bar a team of X-Men (Colossus, Dazzler, Havok, Psylocke) arrived to find and rescue Polaris but after facing several of the Savage Land barbarians they took one prisoner, threatening to kill the barbarian. However, just then the Savage Land Mutates (Amphibius, Barbarus, Gaza, Whiteout) arrived to deal with the heroes. 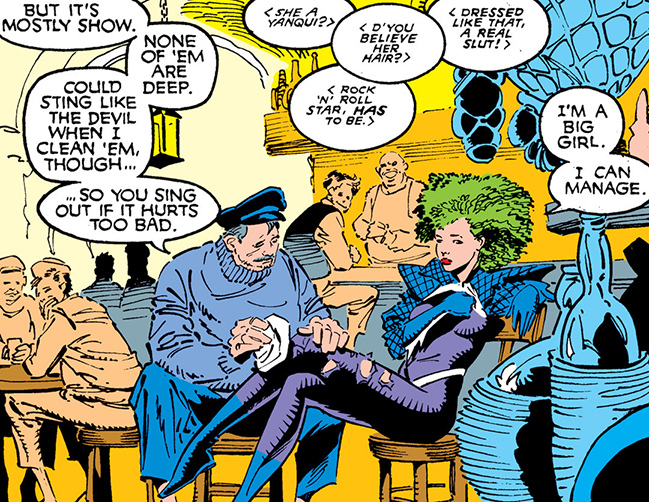 (Uncanny X-Men I#249 - BTS) - Zaladane's forces delivered Polaris and a group of local residents to Zaladane. 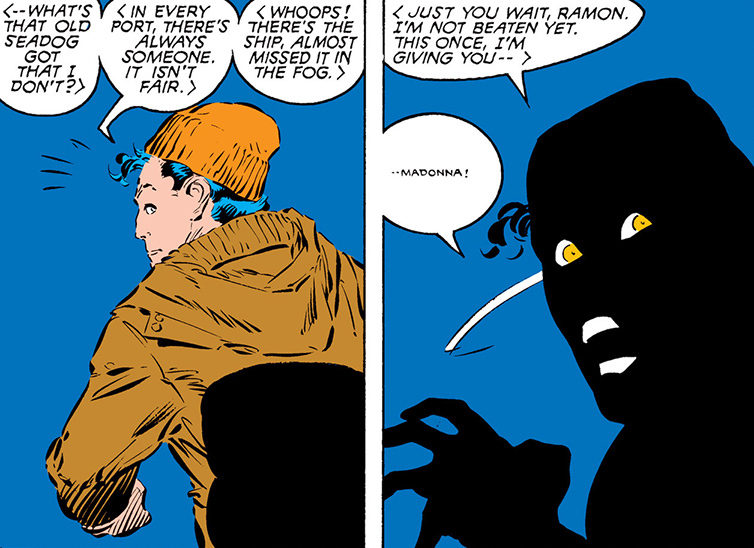 The X-Man Havok secretly infiltrated Zaladane's forces. (Uncanny X-Men I#249) - Zaladane's forces surrounded the local residents of Punta Arenas while Zaladane spoke to them, keeping Polaris in check with a Black Lotus flower. Zaladane told the locals the destruction of their homes was right and a fitting retribution for befouling the Antarctic waters with a cargo of oil. 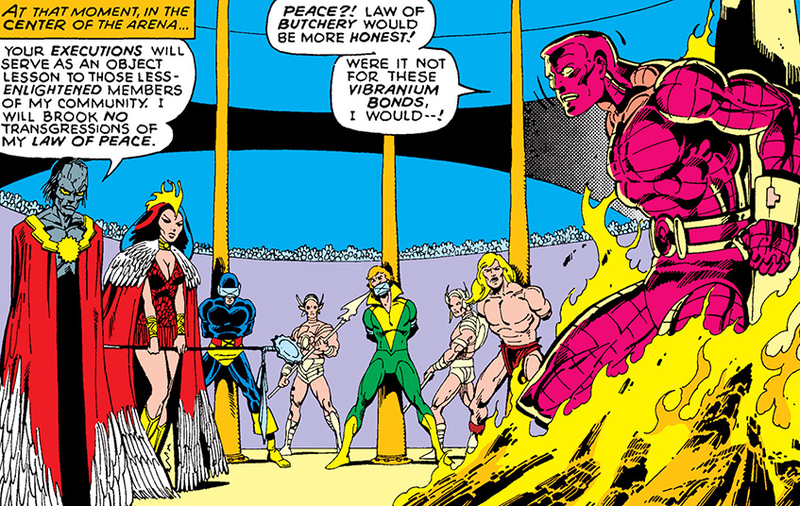 But before Zaladane could continue her speech the X-Men arrived, bringing with them the defeated mutates. Zaladane then proposed an exchange, the mutates for her prisoners plus a safe withdrawal. The X-Men accepted, Zaladane's forces then retreated unaware Havok was now amongst her forces. 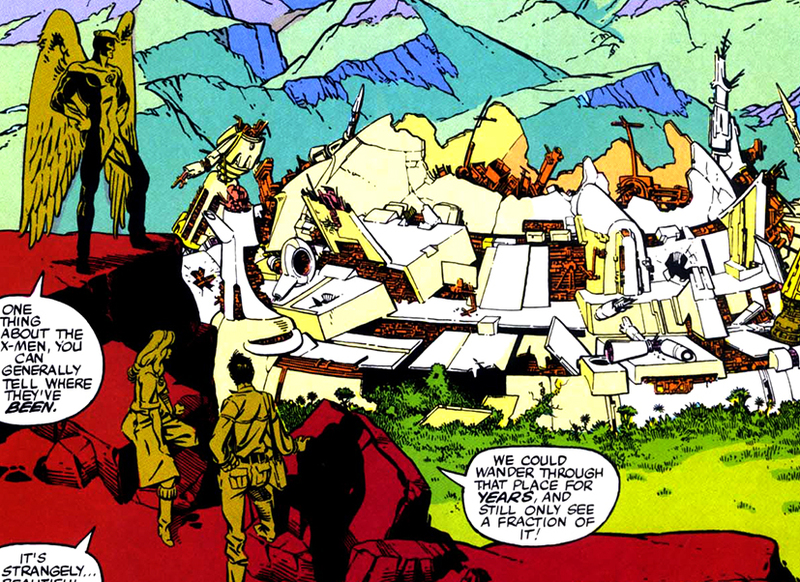 (Uncanny X-Men I#250) - As the barbarians and mutates approached Antartica, a large citadel rose up directly under research station, Vostok 3, killing most of the operatives. Zaladane ordered her forces to slaughter the injured and had the capable survivors rounded up and brought them aboard their transport. Within the citadel was the High Evolutionary's transmutator that had been modified by Brainchild. When Havok, still amongst Zaladane's forces heard she planned to use the machine on Polaris he decided to act. However, mutates Gaza and Lupo had already sensed the outlander and easily overpowered him after which Amphibius used the Black Lotus to subdue Havok. Zaladane's forces then watched as Zaladane used the machine to steal Polaris' mutant abilities after which all of them returned to the High Evolutionary's abandoned citadel within the Savage Land. Upon returning to their home the barbarians presented their Russian prisoners to one of the new Savage Land Mutates, Worm. Worm used his mucus-like slime, covering the prisoners in it so he could control all of their actions and have them join Zaladane's army. (Uncanny X-Men I#250 - BTS) - Sensing the X-Men had arrived in the Savage Land as well Zaladane used her abilities to control Colossus, forcing him to almost kill Psylocke while Worm used his abilities to capture Dazzler. Zaladane had Worm possess the three X-Men and had them capture Ka-Zar, Shanna, their son, Nereel and her son Peter to emphasize she was now truly in control of the Savage Land. (Uncanny X-Men I#250) - Several of Zaladane's barbarians were present when the possessed X-Men arrived with their prisoners in the Citadel's throne room. Zaladane offered to demonstrate her newfound powers by having Colossus kill the two children. Chaos struck when a super strong Polaris escaped her imprisonment and attacked, and young Peter managed to knock out Worm with a gun blast, freeing all of Zaladane's captives. The impact gave the X-Men the opportunity they needed to free themselves and fight back. In the end, as Zaladane's citadel began to collapse in on itself, the X-Men led Nereel, Peter and the others to one of the facility's skysleds and flew to freedom. (Uncanny X-Men I#274 (fb) - BTS) - Zaladane began amassing power across the Savage Land. She took over the High Evolutionary's former base, took control of the Savage Land Mutates and constructed five more towers across the Savage Land that would draw in magnetic power, increasing her own abilities. Zaladane's barbarians and mutates began capturing several natives and turning them to Zaladane's will. In time, she had control of much of the Savage Land, her power slowly increasing, and she sought to gain even more. When Nick Fury and a S.H.I.E.L.D. transport came to investigate, Zaladane struck them down, then made it so no electronics (beyond those maintained by her or their own generators) could be used. (Uncanny X-Men I#274) - One of Zaladane's war parties, led by Barbarus, Amphibius and Whiteout found and attacked Ka-Zar, a weakened Magneto, and the powerless X-Man Rogue. However, before the barbarians could even act they were ensnared with metal coils of Magneto's doing. After they defeated the mutates Magneto was about to kill Barbarus when Rogue convinced Magneto not to kill him. The barbarians and mutates were left in a cave while the heroes returned to Magneto's old citadel. (Uncanny X-Men I#274 - BTS) - Zaladane's war party and the mutates returned to Zaladane, alarming her to Magneto's presence. (Uncanny X-Men I#274) - Zaladane herself led a large army of her barbarians, mutates and prisoners under the command of Worm towards Magneto's citadel. The army was engaged by the United Tribes who'd sought refuge in the citadel, they, however, were easily defeated and turned over to Zaladane's side by Worm. The citadel itself was lit on fire, forcing Magneto to come out. Magneto used his mutant ability to kill several of Zaladane's barbarians before Zaladane herself attacked the mutant. Using the powers she'd previously stolen from Polaris, Zaladane easily defeated Magneto, with Magneto falling down to earth Zaladane declared she now ruled supreme. 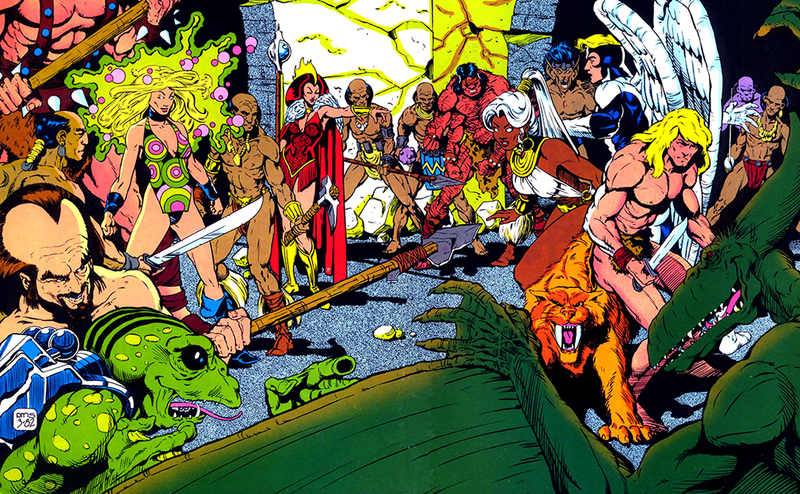 Zaladane's barbarians then focused their attention on the remaining members of the United Tribes (Nereel, Peter and others), Ka-Zar, Shanna and Rogue. With some help from Gaza and Lupo the barbarians easily defeated them but were suddenly attacked by Nick Fury and the downed S.H.I.E.L.D. agents (including Yuri Semyanov) who joined the fight. The barbarians and mutates retreated, fleeing to warn Zaladane. (Uncanny X-Men I#275) - A group of Zaladane's warriors, flying the pterodactyl-steeds attacked a group of helicopter gunships which were on their way to go and stop Zaladane. From the sky the warriors watched as Colonel Yuri Semyanov of a Russian task-force affiliated with the United Nations opened fire on Magneto, hoping to exact his revenge on the former terrorist for killing his on Dimitri when he'd sunk the Leningrad. But while Magneto fell to his death his powers overloaded causing another helicopter with Nick Fury, Ka-Zar and Rogue to crash. The sky warriors decided to seize the opportunity and attacked the Russian helicopter. (Uncanny X-Men I#275 - BTS) - Zaladane's warriors imprisoned Colonel Yuri Semyanov and his men, they also found the unconscious Magneto and delivered all of them to Zaladane. Semyanov was granted an audience with Zaladane for taking down Magneto, Semyanov tried to convince Zaladane to get the Savage Land acknowledged as a sovereign nation with herself as rightful ruler if she would kill Magneto. Zaladane did want Magneto dead but not before stealing his magnetic abilities as well, adding to those she'd already stolen from Polaris. Magneto was placed in a siphoning device by Brainchild where she took some of his powers. Zaladane decided to keep Magneto alive for one more day so that she could get more of his power before killing him. (Uncanny X-Men I#275) - Not much later Gaza and two of Zaldane's warriors who were guarding the citadel's premises noticed a girl being chased by a Tyrannosaurus rex. While the two warriors were amused by the event the blind Gaza noticed there wasn't a dinosaur out there after which the girl rushed into them, knocking them unconscious. The girl was in fact Rogue, using a holographic projector, joined by Ka-Zar, and Fury they stormed the base. While the group attacked Semyanov and Zaladane, Rogue was suddenly repowered, with her superhuman strength she quickly took on a large group of Zaladane's warriors and those turned by Worm. During the fierce fight Magneto quietly slipped away, using Brainchild's device to repower himself. Magneto then used his magnetic abilities to kill Semyanov after which he used the metal coil to ensnare both the mutates and warriors. Thinking the threat to be over with the heroes were shocked when Magneto focused his attention on Zaladane, wanting to kill the woman for nearly destroying the world, although Rogue and Fury tried talking sense into the man he still killed her. Zaladane's base and towers were soon destroyed, those turned by Worm were returned to their normal state. (New Avengers I#41 (fb) - BTS) - Ka-Zar convinced at least two of the Sun People warriors to join together with him, Shanna, and other Savage Land forces (including members of the Botor/Tree People, Man-Apes, Pterons, Swamp-Men, Zebra People) to oppose the Skrull-infiltrated/controlled force invading the Savage Land. (New Avengers I#41 (fb) ) - Two warriors of the Sun People (and possibly others unseen) were among those led by Ka-Zar to confront the Skrull/S.H.I.E.L.D. force; they witnessed the S.H.I.E.L.D. group seemingly destroy the Avengers. (New Avengers I#41 (fb) - BTS) - Ka-Zar's united force apparently continued to oppose the Skrull/S.H.I.E.L.D. force. (New Avengers I#41) - Ka-Zar's united force encountered Spider-Man (Peter Parker) after he was tossed their way by a Tyrannosaurus rex (Spidey and the Avengers were there confronting the Skrull sleeper agents posing as Earth heroes who had escaped from the Skrulls). Ka-Zar and Shanna suspected Spider-Man to be a Skrull, and vice-versa. After Ka-Zar detailed recent Skrull/S.H.I.E.L.D. encounters, they were confronted by a Captain America Skrull sleeper agent. Comments: Created by Gerry Conway (writer), Barry Smith (pencils) & Sam Grainger (inks). So, why are the Sun People depicted as being green-skinned humans while in fact they just have a regular skin tone? The answer can be found in Savage Tales Annual#1 (1975) which reprinted the original storyline from Astonishing Tales I#3 through #5. Although the issue itself is in black and white it has a glorious cover in color where Ka-Zar fights one of the Sun People who has green skin. It would appear the editor's of the Official Handbook of the Marvel Universe Deluxe Edition#19 (December, 1987) used this cover as a reference for coloring the handbook image. Which in turn caused the Sun People appearing in New Avengers I#41 to have green skin (hey, if it's in the Handbook, it must be right, right). It's a shame artist Billy Tan apparently mistook the Sun People's gold helmet pieces as part of their head, which resulted in him drawing them with large, elf-like ears as well. Research is key, people. The error has since been recognized and fixed by the 21st century handbook team as the Sun People were "caucasian"-toned in the Savage Land profile. The Official Index to the Marvel Universe lists the Sun People in Uncanny X-Men I#249/250 & Uncanny X-Men I#274/275 as Zaladane's Horde and Barbarian dinosaur riders. They were first called Zaladane's Horde in the Marvel Fanfare stories. It makes sense that they weren't called the Sun People anymore since Garokk was out of the picture and they were loyal only to Zaladane, it also wouldn't have add anything to the story to call them that. We do have to make it clear that not all of Zaladane's Horde were the Sun People warriors, a large part of them were prisoners who were controlled by the Savage Land Mutate Worm. 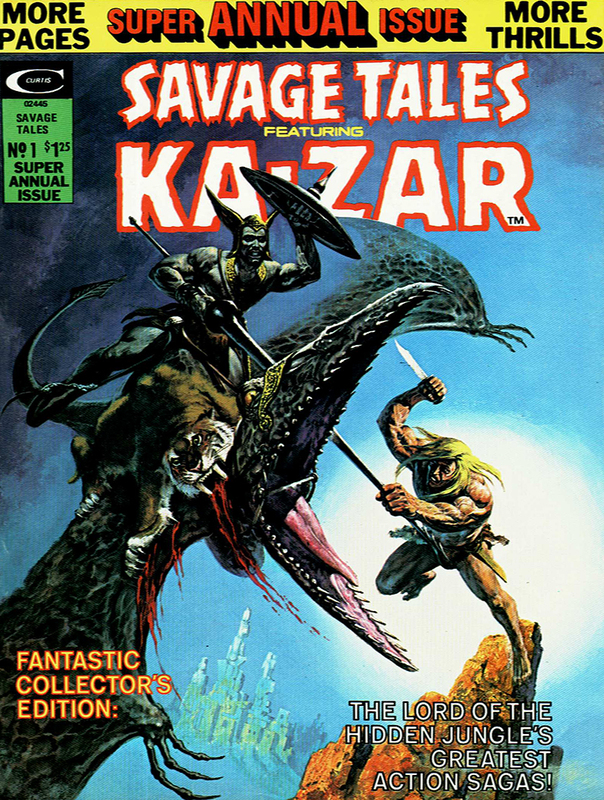 Astonishing Tales I#3 through #5 were reprinted in Savage Tales Annual#1 (1975). X-Men I#116 was reprinted in Classic X-Men I#22 (1988). The Sun People received a profile as part of the Savage Land races in the Official Handbook of the Marvel Universe Deluxe Edition#19 (December, 1987). Garrok's original storyline is an amazing and fun read, it's been collected in the Ka-Zar Masterworks vol.1 go and read it! The Dark One was a towering sea snake living in a lake near the Empire of the Sun in the Savage Land. The Sun People had supposedly seen and fought the dark one before. When the dark one attacked three boats he was stopped by the Sun God Garrok who unleashed a powerful blast that killed both the dark one and his people. The Guard-Beast was a large ape-like creature living in the caverns beneath the Empire of the Sun. His sole purpose was guarding the black pool from outsiders. In an attempt to kill Ka-Zar, Zaladane had left the jungle lord in the caverns for him to face the Guard-Beast. The Guard-Beast, however was rather easily defeated. Sometime later, after the beast had been covered under the rubble by an ongoing battle between Ka-Zar and Garokk the Sun God he regained consciousness and attacked Zaladane. Both the Guard-Beast and Zaladane were trapped in the caverns when the large stone statue of Garokk fell on top of the duo. Kor-At was one of the warrior Sun People who was sent to capture the X-Men when they discovered their giant, domed city was destroying the Savage Land. Flying a pterodactyl and armed with a net, Kor-At and other warriors successfully caught Banshee (Sean Cassidy) and even used a mew to throw Ka-Zar the jungle lord off a cliff for him to be captured by other warriors. Kor-At and the others successfully returned to their dome with their prisoners. 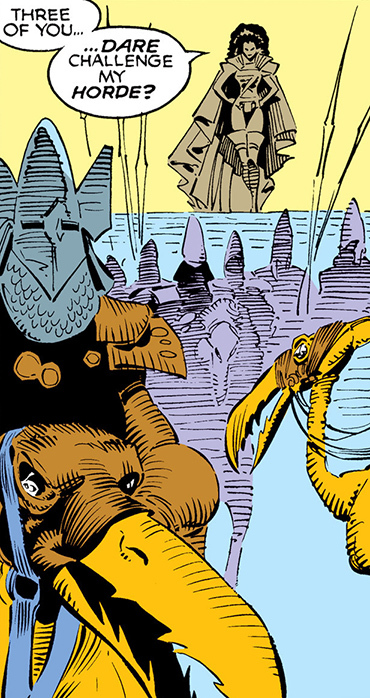 Garokk and Zaladane ordered the Sun People to construct a massive domed city in the heart of the Savage Land where all races would live peacefully, even if the Sun God had to enforce their peaceful co-existence. Garokk used much of his own energies to help build the gigantic citadel, but the Sun People also tapped into the alien terraforming equipment that helped maintain the Savage Land's tropical climate. They siphoned off energy to power the city, not realizing they were inadvertently harming the land itself. Shortly before he city was completed, the Sun People were attacked by the forces of Karl Lykos, Ka-Zar, Nereel, and Tongah of the Fall People. However the Sun People struck hard and forced them to retreat back into the jungle. 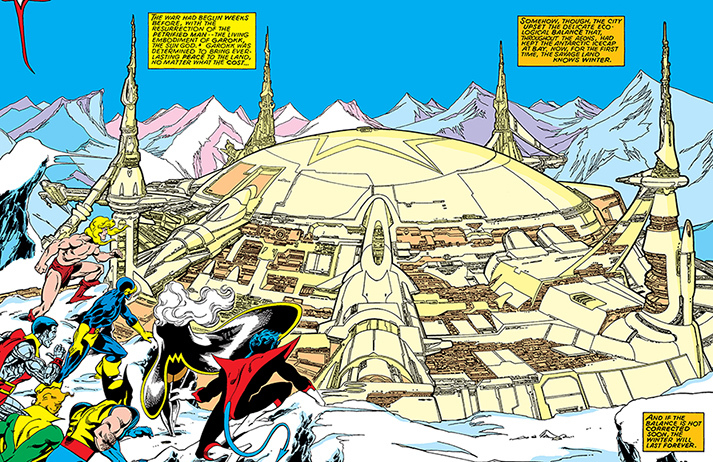 The construction was finished and when the city was put in use, the massive energy drain the dome put on the Savage Land's machinery caused the land to turn into a frozen wasteland. The dome was eventually destroyed by a fight between Garokk and Cyclops. Sometime after the dome's destruction Brainchild and the Savage Land Mutates used it as their base, still later it was used by Zaladane for a short time only. It's been unrevealed what happened to the massive piles of debris. The Savage Land dome was temporary home for most of the Savage Land races who were forced to live under Garokk's roof so to speak. Besides these tribes several dinosaurs like a pack of raptors had found their way inside the dome. Despite its polished, futuristic outward appearance, the dome still struggled with common, unavoidable issues like the handling of garbage and human waste. Luis was a sailor from Punta Arenas in South America. He and his friend Ramon found Lorna Dane after hearing an explosion at the docks. Dane just had another confrontation with Malice, a psionic entity that possessed her. Covered in glass and blood the duo decided to take care of the girl, Luis was ordered to find a doctor and meet them at the cantina. However, before Luis could reach the doctor he was slaughtered by Zaladane's Horde. Ramon was a sailor from Punta Arenas in South America. He and his friend Luis found Lorna Dane after hearing an explosion at the docks. Dane just had another confrontation with Malice, a psionic entity that possessed her. Covered in glass and blood the duo decided to take care of the girl, Ramon ordered Luis to find a doctor and meet them at the cantina. In the cantina Ramon looked after Dane until Zaladane's Horde, riding the Warbird crashed through the front of the bar. Even though Ramon watched how the other sailors were slaughtered he tried to keep Dane save but was rewarded with a spear through his chest, seemingly killing him.